German Foreign Minister calls for Europe to set up payment systems independent of the U.S. in order to save 2015 nuclear deal. 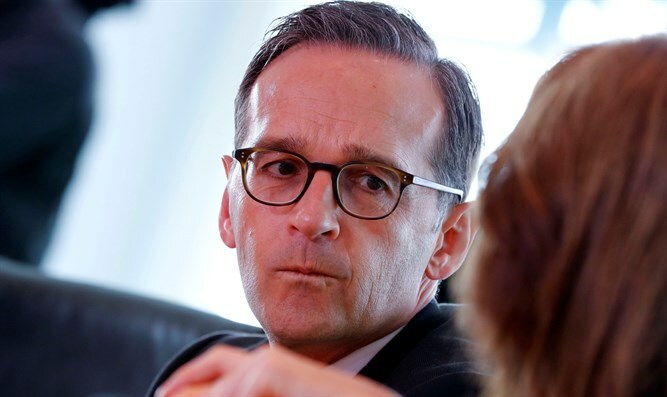 Europe needs to set up payment systems independent of the United States if it wants to save the nuclear deal between Iran and major powers that President Donald Trump withdrew from, German Foreign Minister Heiko Maas said Tuesday, according to Reuters. "That's why it is indispensable that we strengthen European autonomy by creating payment channels that are independent of the United States, a European Monetary Fund and an independent SWIFT system," Maas was quoted as having written in the Handelsblatt business daily. "Every day the deal is alive is better than the highly explosive crisis that would otherwise threaten the Middle East," he added in the article, to be published on Wednesday. The Belgium-based SWIFT global payment network that facilitates the bulk of the world's cross-border transactions shut out Iran in 2012 after the United States and EU agreed to impose sanctions on the Islamic Republic over its nuclear activities. The 2015 agreement between Iran and world powers lifted international sanctions. In return, Iran agreed to restrictions on its nuclear activities, increasing the time it would need to produce an atomic bomb. In May, Trump pulled out of the 2015 deal and recently signed an executive order officially reinstating U.S. sanctions against Iran. Iran urged Europe this week to speed up efforts to salvage the nuclear accord after French oil group Total formally pulled out of a major gas project.